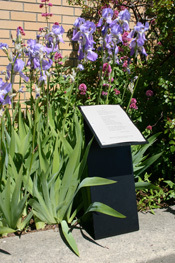 Eugene, Oregon, is the latest city to welcome poetry in public places. This week was the official unveiling of “Step into Poetry,” an installation of poems in the Oak and 10th Street Overpark Stairwell. Initiated by the City of Eugene in cooperation with the Lane Literary Guild, Oregon Poetry Association, and the Young Writers Association, the project features year-long displays of poems by Gary Adams, Barbara Drake, Cecelia Hagen (photo, above), David Laing, Carter McKenzie, Nancy Carol Moody, Deborah Narin-Wells, Paulann Petersen (Oregon poet laureate) and John Witte. Read more about Step into Poetry in The Register-Guard. 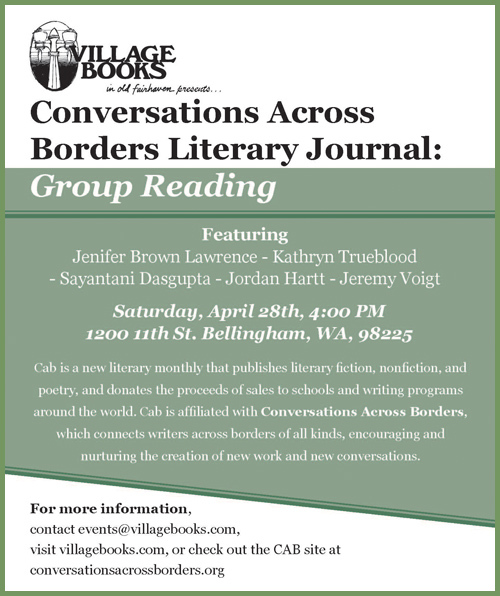 Conversations Across Borders ~ Village Books ~ Saturday, April 28, 2012, 4:00pm. Bringing poetry into the public eye is a central element of the Sue Boynton Poetry Contest. Occasionally on these pages we note other places that have made a commitment to poetry in public. Here’s one. Between 1992 and 2008, New York’s Metropolitan Transit Authority, in collaboration with the Poetry Society of America, “brought more than 200 poems or excerpts before the eyes of millions of subway riders and rail commuters.” The program has been on hiatus since 2008, but has now been revived, beginning with a poster that combines art from “The Flora of Bensonhurst,” by Joan Linder, with the poem “Graduation,” by Dorothea Tanning, an American poet, writer and visual artist who died at the age of 101, in January 2012. To see a larger image of the poster and learn more about the Arts for Transit program, see the MTA website. Find additional details in the New York Times. Plus, read the story in yesterday’s Gothamist, which explains that the selected poems will be screened in brief animations in New York’s taxicabs! Egress Studio is working feverishly to design placards of the winning poems from the 2012 Sue Boynton Poetry Contest. 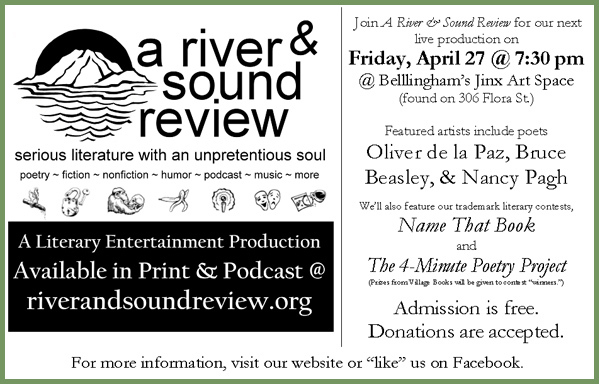 We hope to have drafts on view at the awards ceremony, May 10, 2012, and have the poems installed in Whatcom County’s buses sometime in July. If you’ve found your way to this site, it’s quite possible you’ve attended plenty of poetry readings. Then again, perhaps not. If you’re uncertain about the etiquette or attitude, first have a look at this good humored article from Nashville Scene: How to Attend a Poetry Reading, then click over to the NW Lit Events page and cozy up to a reading coming soon to your neighborhood.